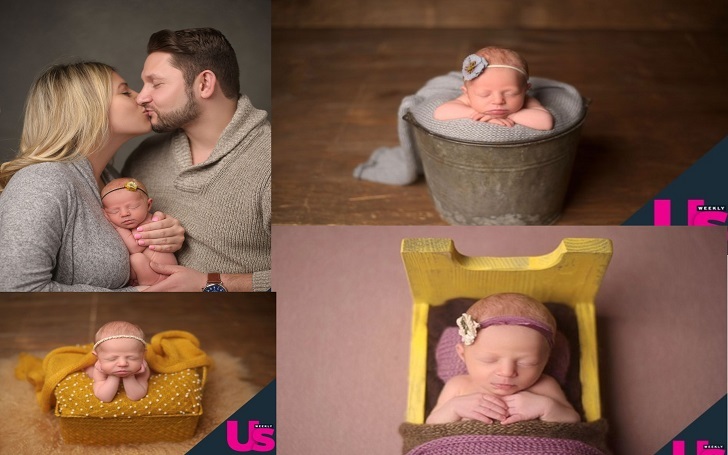 It’s been two weeks Ashley Petta and Anthony D’Amico welcomed their first child, a baby girl, and the former Married at First Sight stars have shared photos of their newborn daughter, who they named Mila Rose. The new mom, 31, told Us Weekly, with who the couple shared pictures, "We are doing really well. She added, "Being a mommy is hard work but I’m loving every minute of it. She’s already grown so much in such a short period of time, it’s crazy." Meanwhile, the proud father, 35, admitted that the first week since the birth of the baby was a little bit intense. We were so tired the first four days, we didn’t know if we were coming or going! Any sound or hiccup she made at night we shot up like a lightning bolt. All Ashley would have to do is tap my shoulder and I would go into startle response, like, ‘What’s going on? Where’s the baby?’ But after the first few days, we got into more of a routine and that has been great. Here's the collage of photos the couple shared with the outlet, check it out. As we previously reported, the reality stars welcomed their first child, daughter Mila, on Saturday, January 12. The confirmed the birth news to Us Weekly saying at the time that the baby arrived "3 weeks early on 1/12/19 at 3:34am weighing 4 pounds and 14 ounces." Ashley and Anthony, who became married on the Lifetime's MAFS season 5 in 2017, announced they were expecting their first child in the late August of 2018. Days later, it was confirmed that Ashley and Anthony and another MAFS couple, Bobby Dodd and Danielle Bergman, both were expecting baby girls. They are yet to welcome their baby. Did Katy Perry Use Her Position on 'American Idol' to Assault Young Men, Contestant Benjamin Glaze?